A deranged killer lives in the basement of an old mansion and pops out occasionally to commit grisly murders that include be-headings, ripped throats, and stabbings with a fireplace poker. The killer needs fresh body parts to rejuvenate his cells........ He also has maggots for blood. Ah Lucio Fulci, the Italian splatter master. Here he offers us his third instalment of his "Death Trilogy" (including "City of the Living Dead" and "The Beyond"). When you put on a Fulci film you know exactly what you're in for and this film is no different. 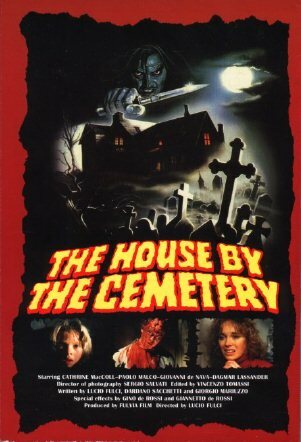 "The House By The Cemetery" is your typical Fulci slasher flick and I don't mean that as a bad thing. His films always had a special aura about them, yes they're way, WAY over the top but that's why we love his work. He had his own style that will never be reproduced, he truly was one of a kind. This film is a perfect example of his legendary work, it's easily up there with "Zombie". His over the top style was perfectly suited for this film, with gore galore and effects that will make even the most seasoned Horror fan squirm in their seat. The one big problem with Fulci films is the atrocious dubbing, although the dialogue for this film was done in English, the movie was still dubbed in post-production, I never understood why. I always felt that if given the right budget he could produce a masterpiece, but what he did with what he had was still great, a true diamond in the rough. The film has a Lovecraft feel to it, which along with the bad dubbing and erratic editing can leave you very confused but just try to look past that and you will find a very enjoyable, gore filled Fulci classic splatter film. Also it's a beautiful film to watch, Fulci always had a great eye for fantastic gothic designs, the set designs are a great cross between old classic Horror and the more modern times. "The House By The Cemetery" is a film you have to watch and not take it seriously, yes it's hard to follow and yes it's hard to watch with the bad dubbing, but it's entertainment value is through the roof!!! Oh and look out for a Fulci cameo As 'Professor Mueller', who talks with 'Norman Boyle' on the New York City street. One of the early VHS issues of "House By the Cemetery" in America got several of the film's reels out of order, further confusing the already erratic story. The trailers for the US release of this film were narrated by Brother Theodore. Apparently the Estate Agent's death was originally longer and nastier and included eye gouging, a Fulci trait. This was cut because Lucio Fulci didn't think the effects were realistic enough. The film's original shooting title was "Freudstein". Though the final line ("No one will ever know whether the children are monsters or the monsters are children") is attributed to Henry James, it was actually fabricated by Lucio Fulci. Filmed on the Ellis Estate in Scituate, MA, where another Italian horror film, Ghosthouse, was filmed. Giovanni Frezza was only eight years old when he was cast as Bob in this movie. Silvia Collatina, who plays Mae Freudstein, also was the hands of Dr. Freudstein. Catriona MacColl overcome her aversion to bats as a direct result of acting in this film. Paolo Malco kept one of of the mechanical bats that was used in the sequence in which a bat bites his hand.